American delegation walks out of ceremony in honor of Tunisia's constitution after Iranian lawmaker slams the U.S. and Israel. The speaker of Iran’s parliament criticized Israel and the United States during a ceremony in honor of Tunisia’s new constitution on Friday, causing the American delegation to walk out of the celebrations, Reuters reports. Addressing the ceremony at the National Assembly in Tunis, Ali Larijani referred to Israel as a "cancer" in the region. He accused the Jewish state and the United States of trying to "sterilize" the Arab Spring revolutions. 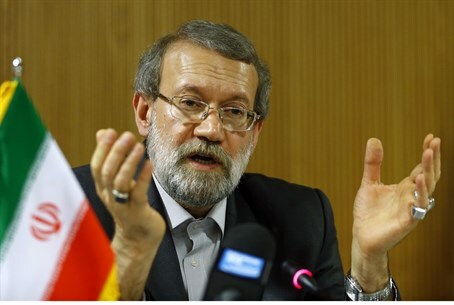 Larijani charged, according to an Arab translation of his speech quoted by AFP, that Israel and the United States had "tried to render these (Arab) revolutions sterile, and to make them deviate from their course so that Israel can benefit." "The U.S. representatives present at the NCA departed the ceremony due to the false accusations and inappropriate comments made by the Iranian representative present regarding the United States," added the statement, quoted by AFP. Deputy Assistant Secretary for Maghreb Affairs and Egypt, William Roebuck, was Washington's top representative at the ceremony, which was also attended by African and Arab leaders, as well as French President Francois Hollande. Larijani is no stranger to anti-Israel statements. Earlier this week, during a meeting in Tehran with the leader of the Islamic Jihad terrorist group, the Iranian speaker said that armed warfare against the "Zionist regime" is the only way to "free Palestine," and that Iran's policy has always been the "defense of the Muslim peoples, and particularly the rights of the Palestinian people under occupation." Another Iranian official, Hossein Salami of the Iranian Revolutionary Guards, said last week that "if the Islamic nation would unite, it could minimize the breathing room of the U.S. and the West until the Zionist regime would no longer have room to breathe."